From unconscious bias to inclusive language, there will always be work to do when it comes to diversity and inclusion in the workplace. Are you or your organization looking to start a diversity and inclusion initiative? 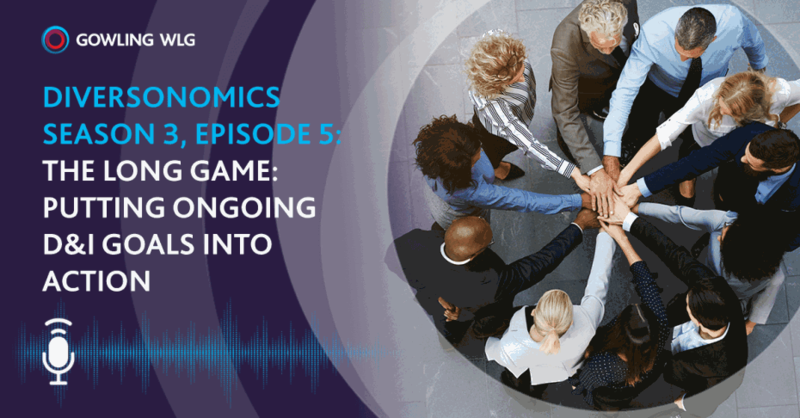 Take a listen to this week's episode of Diversonomics, where our co-hosts speak to Rebecca Bromwich and Asfrah Syed-Emond, members of the County of Carleton Law Association's diversity committee, about how to create an environment that includes and reflects the diversity of their local legal community. Sarah: Hello, hello, hello. This is Season three of Diversonomics. The podcast about diversity and inclusion from Gowling WLG. I am your co-host, Sarah, and I practice in litigation in Gowling's Ottawa office. Roberto: Also in Ottawa I'm your co-host, Roberto. We've spent a lot of time on this show talking about diversity and inclusion inside Gowling WLG but earlier this year I got an opportunity to get involved in an external group that is promoting diversity and inclusion around Eastern Ontario. I was recently elected as a board of trustee for the County of Carlton Law Association, or CCLA. And for those who don't know, the CCLA is the law association for Ottawa and the surrounding area. Once elected I was able to leverage this into getting onto the prestige CCLA's diversity committee. That was a great achievement to get onto this committee. I had to get onto the board to make sure I could get onto the committee. Today, it's the first time that we have two guests on the show at the same time. The first being the original Chair of the CCLA's diversity committee, Asfrah Syed-Emond. Roberto: Welcome to the show Asfrah. Roberto: As well we have on the new executives on our committee, Rebecca Bromwich. Welcome to the show Rebecca. Rebecca: Hi. Thanks for having me. Roberto: Great. So, Asfrah, tell us a little bit about yourself. Asfrah: Well, I'm a local. I was born in Ottawa and just raised across the bridge in Aylmer, Quebec. I'm a graduate of the University of Ottawa and I was called to the Ontario Bar in 2000. I currently practice part-time in a small boutique practice, personal injury, with my spouse and I'm a full-time professor at Algonquin College teaching paralegals and law clerks. Roberto: What brought about your interest in diversity and inclusion? Asfrah: I think that came about at a very young age. I still remember in grade three I had my first racialized teacher. She was a substitute teacher and I decided to bring her home for lunch because I couldn't believe that I had a person that reflected me at the front of the class. That kind of, for me, was something really different and I thought, "Wow. This means I can be a teacher." You know? We went to the principal's office and I told the principal, "You know, this is the first teacher I have that's like me and I want to introduce her to my mother." And fortunately, my second racialized professor/teacher was at law school. You can imagine the years between grade three and, you know. So since that early on experience I work closely within the community to bring about awareness regarding diversity and inclusion. In my practice, as well, I have a lot of clientele from different walks of life. At the College my students come with a wide range of background. So my interest has been there from a very young age. Roberto: That's very you to bring a teacher home. Asfrah: We had to go through a little bit of hoops. We had to go to the principal's office and he was a little bit, "Okay. Maybe we'll call your mother first." Because I was adamant that I somehow had to show this to my mother or she may not believe me. I was an advocate early on. Roberto: That's amazing. Rebecca, can you tell us a little bit about yourself? Rebecca: Sure. I grew up in Calgary, Alberta and I left Calgary to go to law school at Queens and over the course of that situation met my partner and my legal career has been complicated by a series of moves to do with my partner's training. I became aware of gender issues in the context of growing up as a child and being a woman. But as a white girl with fairly privileged upbringing I think I became more acutely aware of diversity and inclusion issues when I lived in the United States for a while. That's not to say that these issues aren't significant here. It's just that I noticed them differently because, suddenly, instead of being a person who could walk in through courthouse security because I was a lawyer and I had my special pass, I was someone who didn't have that status. To have my status radically change by not being in a jurisdiction where I was a lawyer, being in a place where my immigration status was precarious because I had a visa that was based on my marriage and so, fortunately, it was a good one. But had I had marital difficulties then there would have been a major issue with where my children would reside. I did some graduate work in women's and gender of sexuality studies when I was in Cincinnati because I couldn't practice law and I had four young children at the time, very young. Then when I came back to Canada I had this very different perspective on the practice of law and on equality issues. I was excited about further studies so it started my PhD, which I completed in 2015. I've been practicing law since 2003 but I've been full-time academic since completing my PhD in 2015. I still maintain some privy and crown work but for the most part I'm a full-time academic here at Carlton University in the department of Law and Legal Studies. In that period of time that I've been practicing law I was also, for six years, a staff lawyer at Equality and Law Reform while I was doing my PhD at the Canadian Bar Association. I was tasked with being the staff support, with a colleague, to the equality committee of the Canadian Bar Association. I got very closely involved with that work. When I left that role to come full-time into academia I thought it would be great and the opportunity came up to become involved with the CCLA's diversity committee which does quite similar, although not identical work, to the work I had done with the Canadian Bar Association. Sarah: That's fantastic. Both of you have had some amazing experiences and we're really glad to have you on the podcast today. I guess as a starting point I'm hoping you can tell, Asfrah, tell us a little bit about the CCLA's diversity committee, who's on the committee, what is it all about? Asfrah: Sure. This committee came about two years ago, over two years, May 2016. Basically, CCLA tasked us with coming up with an overall approach, or a philosophy, that the CCLA could basically adopt to ensure that they were inclusive of the entire legal community here in the Ottawa and surrounding area. More specifically, we canvassed potential people to come onto the committee. Everyone on the committee has a certain level of expertise in this area. We have a very diverse committee from types of practice to where they grew up, what they do, what they stand for. It's a very fun, exciting group of people to work with. We have small firm, large firm, government, academic, so it's a nice mix of people. Basically, one of our first tasks, or mandates, was to come up with a definition for what diversity and inclusion means within CCLA. We put that together. It's actually up on our website and once that was completed we sort of sat down as a committee, as a whole, to figure out what exactly we wanted to do and what was important to the community within Ottawa. That's where we kind of kicked off from. One of our major projects was putting together a document regarding inclusive language. Because we kept finding that in a lot of materials that would cross our desk, language was not being inclusive. Using words like "spouse" instead of husband or wife. Different issues like that that came about. We published a paper we're pretty proud of and it's up on our website for different members of the bar to go in and have a look at if they, in fact, have questions. We took some initiatives, basically starting the first, we had an event where Black History Month, it was the first one we had put on. We had the Honourable Justice Fraser, Professor St. Louis came out as guest speakers for us. We're putting on a lot of equality diversity inclusion training programs. In fact we have, I'll do a plug in now Roberto, we have one coming up at the end of September that Rebecca was instrumental in putting together. Different initiatives like that, we were at the flag raising for Pride just the other day. Making the community more aware of diverse events that are taking place right here in Ottawa. Sarah: That's fantastic. two years, you said the committee's been around, so it's relatively new, Rebecca. Sarah: Yeah. It sounds like you've done a lot in two years. You guys have been extremely busy. But, Rebecca, can you talk about, do you have any advice or other associations or organizations that are looking to start a diversity and inclusion imitative? I guess two years out you might have some advice even though it hasn't been too long. Rebecca: Well, I mean, I have my experience that I've had with the CCLA and also with the Canadian Bar Association. I was in the equality in law reform lawyer role for six years prior to that. I think it is still worth doing. To have a diversity and inclusion or equality committee, even though a lot of times people will say, "Well, equalities been achieved." and I think that it's important to recognize and acknowledge that actually these issues remain live issues. Diversity issues need to be worked on all the time. They are like fitness. You aren't just sort of fit one day. You have to stay fit. You've gotta keep running, keep working out. Even if the institution or organization you work with is committed to diversity then the practical pieces need to continue to be put in place. Because I teach students I see in every new cohort that similar issues arise. It's important to be aware that these issues continue to be significant. Another thing is in setting up the committees it's important that they have a meaningful and close relationship with the leadership of the organization and there has to be championing of the diversity and inclusion imitative by people in senior leadership roles. There is a role, for example, for white men who are in leadership roles in that to make sure that these things get endorsed, promoted, championed. Then I would also say it's important, for the committee itself and the organization itself, to think about manageable smart goals that can be achieved. When we look at equality issues sometimes it can be incredibly depressing, actually. To think about the state of things and how, for example, in approaching 20 years that I've been associated with the legal profession, a lot of the problems actually haven't been eradicated at all. We continue to have these issues and to keep, as a committee and as an organization, looking at what can we do today. What is one thing we can do well and to set those initiatives in manageable ways that they are achievable. Then progress actually can be made. Roberto: Great. Asfrah, what are some of the opportunities for the committee going forward? Asfrah: Going forward, what we were thinking and working towards, is building bridges with the University of Ottawa Law School is one of the them. So we can sort of onboard recent graduates. Bring them into the folds of CCLA as well as the diversity committee. We're doing liaison with other community organizations such as CABL, Canadian Association for Black Lawyers, and we don't want to reinvent the wheel and we can learn a lot from these other organizations as well. We're really reaching out to other communities going forward. Roberto: Great. And for the last question I've got, I definitely want to put it to both of you, but we'll start with Rebecca. We have a lot of listeners that are students. Do you have any advice for them, generally? Sarah: That's funny that you gave that advice because I was at a talk with former Justice Beverley McLachlin the other day. One of the pieces of advice, or I guess comments she made throughout her career, there were times that were particularly challenging or times where you sort of question whether you'll be able to get through a certain period. You come out the other side and typically it's not as bad as you thought and you're grateful that you've put in that effort and put in that work to get through the difficult time. I think that's right in line with what you're saying and I think it's a good piece of advice for students. Because there's many stages in a students or young lawyers career where it's difficult. There's things that they want to achieve that they don't think they'll be able to so I think that's fantastic. Rebecca: Yeah. Just to add to that I like the fact that Justice McLachlin's thinking like I do. That's fantastic. I would also like to say that that doesn't mean that everyone should just buck up and do it. We should look for managers. We should look for support and I'm sure that's not what she meant either. Rebecca: Yeah. I know it's not what you meant but in terms of we should look for support and be aware that other people who have been on this journey longer have also struggled. The challenges are there but we can do things. We can. If that belief in oneself, belief in the possibility that actually allows us to do. Roberto: Okay, Asfrah, any advice that you have for students? Asfrah: To echo a lot of what Rebecca said, and again, get involved. Get involved in the local communities and the organizations that are around you. We in fact hosted a women's mentoring event, the diversity committee this year. It was extremely successful. We had many, many racialized women lawyers in Ottawa, judges, who have been practicing for decades. The students were invited to come and they had the benefit of speaking to somebody who's been around and that person could guide them and give them a lot of really informative advice on practice, on things that really matter to young newcomers to the field of law and to show them that you can have some time to devote to areas that you're passionate about and interested in. Roberto: Yeah, no. I think mentorship is so critical and there are opportunities out there for people to find them and a lot of people who are willing to take time for you if you're willing to ask or take that chance to go to that event. Sarah: Well, I think we're just about out of time. I just wanted to thank you very, very much for being here with us today. It was a great chat. Roberto: Definitely appreciate all your insights. For our listeners if you every have any questions, comments or ideas for topics and guests please look us up at gowlingwlg.com and get in touch with us. We'd love to hear from you. Also make sure to check out the show notes at diversonomics.com. Sarah: Last, but not least, make sure to subscribe on Apple Podcast so you don't ever miss an episode. And while you're at it leave us a review and let us know what you think. Roberto: You can follow me on Twitter at @robaburto. Asfrah, do you have anything to plug? Social media or anything? Asfrah: I just want people to become a member of CCLA and follow them on Twitter. Rebecca: Sure. I would second what Asfrah says about following CCLA on Twitter. You can also follow me on Twitter @rebeccabromwich on Twitter. Sarah: Fantastic. Thanks guys. Diversonomics is presented to you by Gowling WLG and produced by Rachael Reid and Amanda Lomas and edited by Josh Bowman. This podcast will count for up to 15 minutes of Equality & Inclusion Professionalism (EDI) credit toward the mandatory CPD requirements of the Law Society of Ontario (subject to the overall limit of 6 hours per year for viewing archived video programs). To learn more about Roberto, visit his bio or connect with him on Twitter or LinkedIn. Sarah Willis is an associate in Gowling WLG's Ottawa office, practising in the areas of commercial and civil litigation, and medical defence law. To learn more about Sarah, connect with her on LinkedIn.